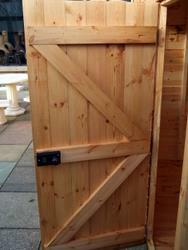 Hi I need to buy some materials to make a 'full size' door for my new garden gate. The fixed parts of the gate are featheredge. Now for the door I could make my Z frame and then have featheredge on the other side to match the rest of the gate or I could just use plane rectangular strips. Any reason to choose oen over the other? Obviously I want the door to be fairly light to put less strain on the frame. Which material is the best? I will be painting it brown with fence panel paint stuff to match my fence panels. Also, when I make my Z frame how do I get it to stay together BEFORE I put the 'covering' on? Would you make the frame first then put the rest of the door on or do it all as you go? Is it glue initally holding the frame together, i don't see any screws apart from those going into the main part of the door?? I would use tongue and groove floor boarding to make the gate. I would assemble the boards and then screw them to the Z frame. The tongue and groove should be stiff enough to hold it together on the ground while you do that. It would be very hard to do this with featheredge boards. Lay out the boards (T&G makes a strong door). Screw or nail on the horizontals ('ledges') and then add the diagonals ('braces') cut and positioned to support the horizontal ledges. Screws / nails are best done from the front - i.e. first through the door panels into the ledges and braces. If you're using T&G it's worth priming the the tongues and grooves before you assemble as they are the weak point for water ingress if not primed. You could use feather edge boards (vertically) but they make rather a flimsy door prone to warping. I prefer a lightweight door with 2" x 1" slats, which gives you privacy, but doesn't blow about in the wind or block the light. Assume you mean new garden shed, not gate? F/E is available treated to resist rot. I make a lot of garden gates out of F/E. Ledges & braces can be 100 x 19 treated or 150mm gravel boards. Measure the width of the opening & deduct around 10mm for clearance. Cut 3 horizontal ledges this size & lay them out on a flat surface in the position you want them. Take 1 piece of F/E slightly longer than the finished height & screw it to the ledges using a square to ensure all is at right angles, 2 screws in each ledge. Loose lay the rest of the F/E across the ledges & adjust until you have a roughly even overlap. Now make a 'spacer' to this gap size. Use this to keep the overlap even. Screw boards to ledges so the last board overlaps the length of the ledges slightly. Turn the whole lot over. Lay out 2 pieces in position for the braces, mark where they meet the ledges, join the lines & cut the angle carefully. Screw in from other side. Trim top, bottom & edge to final size with circular saw. One this no-one's mentioned is that the braces need to "point" the right way, with the base near the hinge and the top on the latch side. For a really quality job notch the ledge a little (say 10mm) where the brace will meet it so the end of the brace sits in the notch. Very true. Surprising how many gates one see's with the brace's pointing the wrong way. ANyone recommend a specific type of screw to use to put it together and a hinge kit? The gate / door in your picture might be considered a bit too elaborate for a garden gate but the design is basically the same apart from the outer frame. Most screws will do but nails are also a possibility because you can use over-long nails and hammer the protruding ends over to create a kind of clinch. Whats the best way to fit them? Onto the post first or onto the door first? I have left a bit of space on either side of the door to fit between the posts. With screws - preferably rust-resistant ones - and don't forget to fit a gate catch as well! Generally you fit them on the "door" first and then the gate jamb. Now that's a good idea, that'll save you having to initially plane them to fit - and then it also allows room for the 'door' to swell during rainy weather. Mo, I seem to have missed something here, is this an extra to a post to one that you have made about making a garden gate and want advice to fit it...or something else? Now presuming that it's about fitting a T&G garden gate, then make sure that the hinges are screwed on the ledges (the horizontal bits) and that any braces (the angled bits) run upwards from the hanging side to the slamming side to take the downward force of the front of the gate and prevent it dragging the ground after a while. Yes I am making a garden gate (or door) and just wanted to know how to fit it. I have bought all the bits and will be putting them together tomorrow as described above. http://i46.tinypic.com/28apzcw.jpg and use either galvanised or japanned screws of the correct size. Depending on how you want the door to open, you can fit the hinges either on the face of the door or the braces (as shown), either way, make sure that the hinge flap is far enough over the edge of the door to fit on the jamb and leave the 3 to 6mm gap between door and frame (ensure the same gap on the slamming side). I would also suggest that you leave something like a 12mm gap between the bottom of the door and the floor (more if possible) - and ensure that the cut bottom and top edges are decorated to the desired finish before fitting to prevent the end grain soaking up water - you can decorate the rest after hanging if preferred. This is a brief outline, let me know if you want more (or specific) information. All I have to do now is cut the lengths for my diagonal pieces. Problem is HOW? I am finding it hard to get the angles properly measured up whilst the horizontal bits are stuck to the door. I am guessing there is an easy way around this - anyone care to share? I am not great at sawwing and ideally would like to be able to get a proper line drawn all the way across the wood or i will end up screwing it up! One way would be: put some sheets of writing paper with strips of double sided tape on the upper side, in roughly the right position on the horizontal boards. Making sure the edge of the paper is neatly along the edge of the board. Then lay your diagonals across so that the paper then transfers to them, and you can then draw along the straight edge and saw to size. Messier methods would be to grease or paint the horizontals and transfer the line across that way. O r of course you can just lay the diagonals in place and mark underneath on either side with a stubby pencil. I'm sure you will think of a method that suits you. Mark in from either edge of the ledges around 25mm, lay the brace with its outside edges on the two points and this will give the angle (see the picture and that will give you the idea) - and simply draw a horizontal line on the top and bottom of the brace following the line of the ledges. Cut along these lines, just leaving the pencil mark in and then drop the brace in (which should be a nice snug fit and possibly needing a tap or two with a hammer to encourage it) and then fix it. You don't need any complicated gauges, maths or sliding bevels to do the job, look at the photo you produced, and the simplicity of it will become very obvious. I would advise against trying to do any of the compound joints here that could be done, and simply use 'flat' faces and rely on a 'snug' fit and screws - remember that you will put two screws into the brace on every board and rising up the angle of the brace. From a purely gravitational point of view, you will find it much easier to put the hinges on the gate while it is lying down comfortably, than when you are trying to hold it up against a swinging hinge that you have fixed to a gate post. On the other hand, once the hinge is on the gate, you can easy stick your foot under the bottom to hold the hinges against the post while you mark off the first couple of holes and get the top screw in. What wood for a gate? How to build a garden gate? Finish for Mahogany Garden Gate? Bell rings when garden gate opens?